Item # 317058 Stash Points: 1,195 (?) This is the number of points you get in The Zumiez Stash for purchasing this item. Stash points are redeemable for exclusive rewards only available to Zumiez Stash members. To redeem your points check out the rewards catalog on thestash.zumiez.com. Give your vest, hat or backpack some high-end fashion-inspired style, with the Stickie Bandits Feezy Orange Enamel Pin. This pin features a dual pin clasp closure for a secure hold and an enamel construction for durability. Highlighted by the image of silver and black shoes, this pin has an original look. 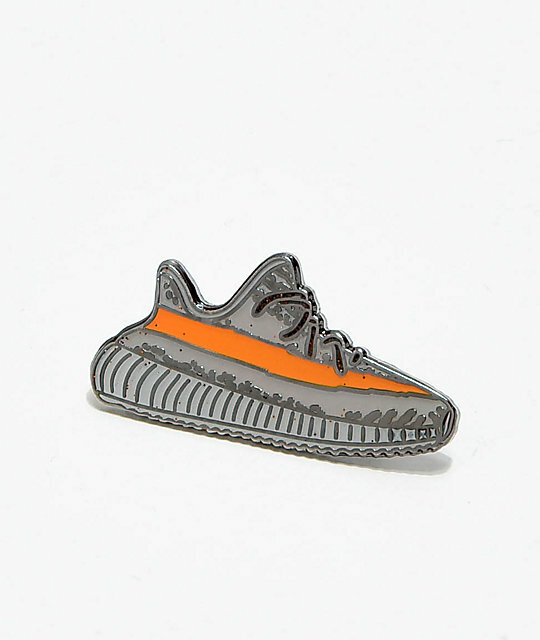 Feezy Orange Enamel Pin by Stickie Bandits. Grey and orange shoe graphic.